Active Ride Shop, online at activerideshop.com, is the go to shop for skate clothing and accessories. Active Ride Shop offers great deals on skateboards, snowboard gear, snowboard clothing, ramps, skate wax, footwear, hats, sunglasses, backpacks, clothing, and more. Active Ride Shop also carries top brands such as Adidas, Burton, Dickies, Obey, and more. 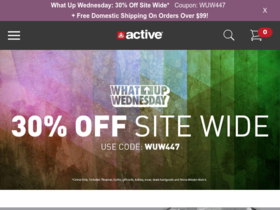 Before shopping at Active Ride Shop, be sure to stop by RetailSteal.com for the latest Active Ride Shop coupon codes, Active Ride Shop discount codes, and Active Ride Shop promo codes. Active Ride Shop also offers shipping promos that change often. Visit RetailSteal.com for the latest Active Ride Shop shipping promos. Use code at Active Ride Shop and save 15% on orders $125+. Shop the sale section online at Active Ride Shop and save up to 60%. Use code at Active Ride Shop and save 10% on orders $100+. Enjoy free shipping on orders $99+ at Active Ride Shop. Use code at Active Ride Shop and enjoy 30% savings on sale clothing and footwear. Use code at Active Ride Shop and enjoy BOGO 50% off on men's denim and pants. Use code at Active Ride Shop and enjoy 50% savings on select sale items. Save 15% when you a build a complete at Active Ride Shop with code. Save $5 with email sign up at Active Ride Shop.